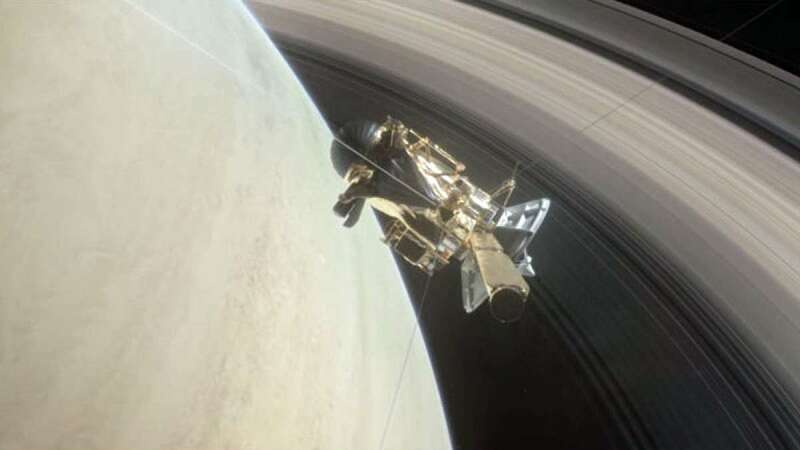 New Delhi : Cassini-Huygens' 18-year-long journey came to an end on Friday after NASA lost all connections from it post its final dip into the Saturn's atmosphere. Here is a timeline of how events folded from its launch to the grand finale. 15 October 1997: The Cassini was launched at 08:43 UTC inside Titan IVB/Centaur rocket. 26 April 1998: Gravity-assisted flyby of Venus at 284 km, receiving a boost in speed of about 7 kilometers per second. 3 Dec 1998: Cassini fired its main rocket engine for 90 minutes, setting the spacecraft on course for its second Venus flyby in 1999. 18 August 1999: Cassini made its closest approach to the moon at 377,000 km and clicked a series of images. 30 Dec 2000: Cassini was at its closest point (9.7 million kilometres, 137 Jovian radii) to Jupiter at this date, and performed many scientific measurements. At that time, it helped in creating the most detailed global color portrait of Jupiter ever produced. 30 May 2001: A little 'haze' was noticed on the pictures clicked by narrow angle camera of Cassini. 26 March 2004: The Cassini science team published a first sequence of pictures of Saturn showing clouds moving at high speed around the planet. Using a filter to better see water haze on top of the dense cloud cover, motions in the equatorial and southern regions are clearly visible. 15 April 2004: Scientists announced existence of two moons around Saturn - Prometheus and Pandora. 18 May 2004: Cassini entered the Saturn system. The gravitational pull of Saturn began to overtake the influence of the Sun. 24 Dec 2004: Huygens probe separated from Cassini orbiter at 02:00 UTC. 14 Jan 2005: Huygens entered Titan's atmosphere at 09:06 UTC and had landed softly on its surface about two hours later. 15 Feb 2005: Successful Titan flyby, with new regions of its surface scanned by radar. Cassini 's mapping radar acquired a picture that shows a large crater on Titan, with an estimated diameter of 440 km (270 mi). 17 March 2005: The Cassini probe reveals that Saturn's moon Enceladus has an atmosphere. It has been described as "substantial" by its discoverers. 1 March 2007: NASA releases several remarkable images of Saturn from Cassini, many in angles not possible from Earth. 2009: Cassini made 15 flybys of Titan and 2 close flybys of Enceladus. 3 Feb 2010: NASA announced that a second mission extension until May 2017, a few months past Saturn's summer solstice, had been funded.